Brush griddle or skillet with vegetable oil or spray with cooking spray; heat griddle to 375°F or heat skillet over medium heat. In medium bowl, stir ingredients until blended. If desired, pour 1/2 cup batter into plastic squeeze bottle with narrow opening to use for making letters. 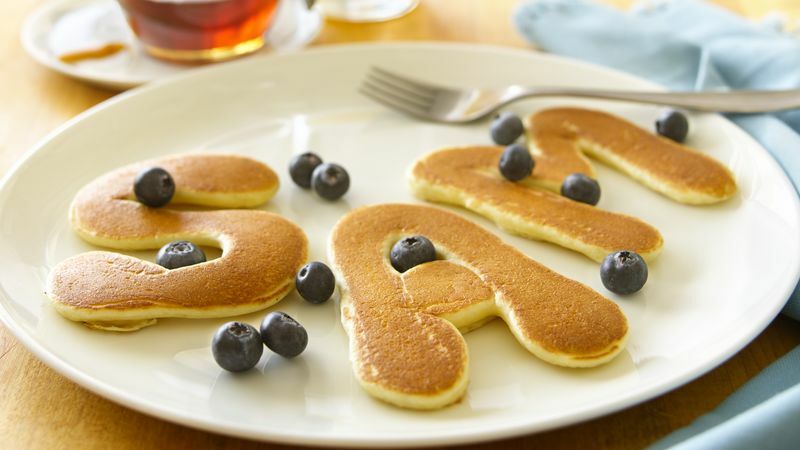 Squeeze batter from bottle or drizzle from spoon onto hot oiled griddle to form letters. Cook pancakes until edges are dry. Turn; cook other sides until golden brown. Animal Pancakes: Form simple animal designs on griddle. Pour batter for round pancake; with a spoon, add small amounts of batter for ears, feet, tail, etc. Some easy designs are: Rabbit--round body; smaller amounts for head, 2 long ears and a little round tail. Turtle--round body; small amounts for 4 feet, the head and tail. Cat--round body; smaller amounts for 2 ears and 4 feet; use raisins for eyes and mouth.